Ouch. While the two nations you expect to make it will be missing, the World Cup can rarely, if ever, be seen as boring. Messi, Ronaldo, Neymar and the rest will all be there in Russia as Germany set out to defend their title. In today's world, kit manufacturers stay as close to their templates as possible so picking a kit is more like a lottery than a preference. International kits are a different breed though, as their sponsor-less and sometimes reflect the country they represent. Today we'll be looking through 7 of the kits that will be worn at the World Cup. And while I'd love to say that there's no particular order, I'd be lying. Very different on everything else on list, I'm used to Nigeria being in solid green so this one stood out quite a bit. At first I thought this was a training kit, so it almost passed me by. It's simple, understated and retro. I'm not sure if it's the photo or the actual material but it looks more like a t-shirt than a football shirt which is also part of the appeal. Another Adidas effort that looks a bit more like a t-shirt than a football shirt. It looks both casual and a little Scottish! Badges in the centre of the chest were all the rage back in the 90s so another nice retro nod.. The current World Cup holders, the kit of course features the now obligatory gold FIFA shield, and the four stars representing the four titles held by West and united Germany. Germany never fail to have a good kit, but I personally think this away kit trumps the home one. Nike hit a home run, to steal a metaphor from another sport. It's casual, it's subtly it's just great. England have a plain white kit but it looks nowhere as good as this. The little dots of colour bring it to life. Nike and Brazil have been together for a long time and their blue away kit is a great contrast to their 'golden' home kits. The sharp camouflage pattern bring a number of blues rather than a single solid colour. Invoking the memory of the great Liverpool sides from the 80's and the gorgeous Liverpool away kit from the 2008/09 season, the Spain away kit is by far my favourite for the tournament. It's not often the away kit outshines the home one, but it's a no brainer here. The Guardian put together a look at the most eye-catching World Cup kits over the years. 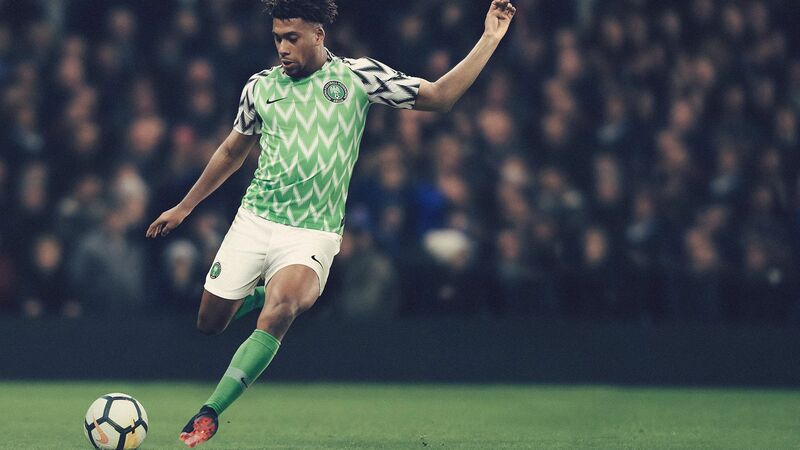 And this past week, people went crazy for the new Nigeria kit, listed as number 7. There were queues around the block at Niketown in London and you could hear more Nigerian fans than you could England in their World Cup warm up.